What Do You Need To Know Before Remodeling a Bathroom - Golden Construction Services, Inc.
What should I consider before remodeling my bathroom? Whether you’re overdue for an upgrade or are just ready for a change you probably realize that a bathroom remodel is a large project. It takes a decent amount of time and planning in order to make the job a success. 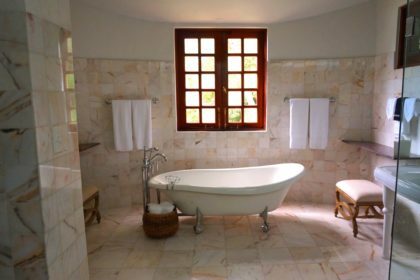 Before you start your bath remodel here are a few things that you should consider. The bathroom can be a damp place on a regular basis. Choosing flooring that is mold resistant and waterproof is best for bathrooms. Some material options are tile, marble, stone, and bamboo. Laminate flooring is a budget-friendly option however over time it does not last in moist bathrooms. As far as design and functionality go lighting is very important to your bathroom remodel. You want to choose lighting that illuminates the areas where you need the most brightness such as over the sink or vanity. In addition, you may want some feature lights over a tub or in the shower area. A great option is adjustable lighting that can be dimmed to create a specific ambiance. First of all most wallpapers do not work well in a bathroom design because they can peel due to prolonged exposure to moisture. A paint that is mold resistant will work best. The color is really up to you. If you are going for a more spa-like, relaxing feeling then choose a light, natural color. Adding design elements such as featured wall tiles or a backsplash or mosaic will add style to your bathroom. Many varieties of tubs and showers are available. Choosing the one that suits your needs is essential to your design. Think of the features that you may want such as a shower with a seat or a soaking tub. A great option for a smaller bathroom could be a shower and bathtub combination. Many tubs are available with a variety of sprays and jets for a nice spa-like feel. This is the main necessity of all bathrooms. You may just assume that the choices of toilets are limited however you do have many options. Toilets come in a variety of shapes, colors, and styles. Newer models are more water efficient and are even available with an automatic flush. When taking on a bathroom remodel it is a large job. Knowing your options will help you make the best choices. Be sure to consult your contractor when making decisions. Their expertise will help you choose what’s best for your home. Call the experts at Golden Construction today to start working on your bathroom remodel.